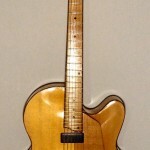 The RSB5-1 was the first guitar designed by Ron Smith. It features a 17” body. Curly maple back and sides. Spruce top. 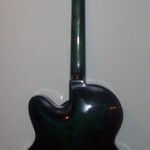 Maple neck with ebony fret board. 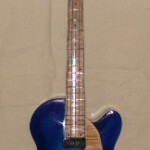 Simulated tortoise binding and pickguard. 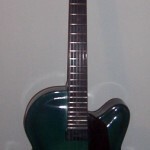 The pickup is a Benedetto S-7 humbucker. 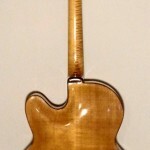 This is a suspended pickup attached to the pickguard in order to avoid cutting a hole in the top. The scale length is 34”. This bass sounds so good acoustically and electrically it leaves little room for improvement. Features a 17” Body. Spruce Top. 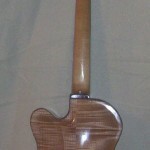 Maple back, sides, and neck. Ebony fretboard, bridge, tailpiece, pickguard and headstock. Benedetto S6 humbucking pickup. This guitar has all the features that I have been wanting to put into one guitar for a long time. That is why it is named ‘The One’ Guitar. The body has a very comfortable feel weather standing or sitting. The cutaway is deep enough to make reaching the high notes easy. I have changed from using 24 frets to 22 frets. This change gives a much richer, fuller sound because the pickup now is positioned under the harmonic. It is also more comfortable for picking. 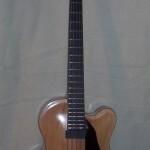 A 24 fret guitar can still be ordered but 22 is my new standard. The scale length is 25”.